A word from Alec Knott, one of the AHS stewards. The perception of the Steward to most people is one of someone who takes numbers and hands out rosettes, a person who has to be there but is of very little importance to the show. The reality is not only the above mentioned but a great deal more. He or she must be most importantly an upholder of the rules and regulations of the Arab Horse Society and be prepared to implement those rules at all times. The job description may leave a lot to be desired, duties including for example, long hours, lunch only if time allows, a vent for aggrieved competitors and no pay in many cases. However being involved and in close contact with the Arabian horse whether it be pure, part or anglo far outweighs those minor details. A good steward can make a huge contribution to the running of the ring therefore allowing the judge to perform his or her duties without any distractions. The steward must be aware that he or she is the voice of the judge to competitors and vice versa and must not enter into conversation regarding the judge. Today, as ever, safety is paramount and this must be uppermost in the mind of the steward to protect horses, riders and handlers at all times. In recent times we have witnessed an upturn in entries of the ridden classes at most large shows. Whilst this is very welcome it has brought along a few problems in perhaps a lack of knowledge of rules and regulations governing ridden classes and ring etiquette. The stewards role in the ridden classes can be a little more demanding than in hand with so many duties to perform. Again safety is paramount in the commands to trot, canter and extend, change of rein etc to avoid what can be, in a big class, a dangerous situation. It is most essential also to be aware of the rules for the show at which you are officiating. While the AHS rules regarding the wearing of a standard riding hat with the correct harness are a recommendation, some shows now state that this must be mandatory. 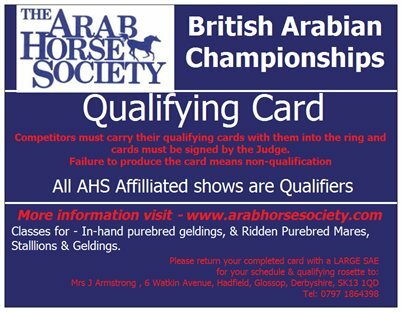 The steward should also be familiar with various qualifying cards and particular awards at the show and be aware of the rule governing cards not to be signed outside the ring . The trend towards the European way of in hand showing has brought many problems both in style of showing and also the unfortunate lowering of standards both in manners and crowd behaviour. The use of what can only be described as lunge whips and the practice of posing the horse using intimidatory methods is to be deplored and wherever possible it is the duty of the ring steward along with the DC to try to redress this trend. At a show where there is no DC it falls upon the steward to try to fulfil the role beginning in the collecting ring looking for obvious signs of disguising exhibits such as trimming of facial hair around the eyes etc. In fact anything which may help the competitor to abide by the rules should be spotted by the steward. In conclusion I would suggest that next time you visit a major show you might find it interesting to observe the running of the ring by established stewards. Whilst there are only a few AHS stewards who regularly travel the country there is a need to encourage more. I am sure there are also long standing judges who will only be too willing to help and encourage. Once bitten by the love for the Arabian horse it is, in my view, an honour and a privilege to be a steward. 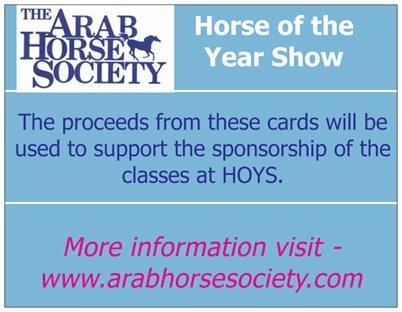 If you enjoy being close to the Arabian horse and would like to don your hat and help at the shows then the AHS Shows and Events Committee will be pleased to hear from you.